Long johns were first introduced into England in the 17th century, but they did not become popular as sleepwear until the 18th century. They were supposedly called long johns after a famous knife fighter who fought in thermal underwear. They were first used as loungewear but then later became popular as sleepwear. Children also wore them as sleepwear, usually made out of cotton and polyester. Now that the weather is getting colder it is almost essential to wear them. Long underwear is ideal for sports where muscles need to be kept warm, for skiing, climbing and trekking, and even three-quarter sports pants for winter training and running. In many cases longs johns are equally suitable for men and women. Jack Adams Core Long Johns are available in three colours as you can see below. This basic gym short is a must have for your gym bag. A great basic athletic gym short with a Rugby flair. Perfect for on and off the field. Practical and lightweight. Lined and without pockets. Fabric: 100% Polyester. The Flex Racer X Fly Jockstrap balances style and performance. Designed for excellent support and comfort and is made from an ultralightweight, moisture wicking mesh fabric. Fabric: 95% Polyester, 5% Rubber. This super-soft sleeveless fleece hoodie is perfect for the guy who wants to just throw something on after the gym. It is extremely soft, and matches perfectly with our popular Raw Gym Short, 100% Polyester. The Relaxed Pant is made with a soft Cotton and Spandex mix for a soft, easy to wear pair of lightweight pants. This modern style fits the body perfectly, resting on the hip. Great for yoga or lounging. Made from 90% Cotton and 10% Spandex. Get your new Jack Adams RELAXED PANT from AlphaMaleUndies. We ship worldwide and at the best rates. With the same great body defining fit and comfort of the Boxer Brief and Cycle Trunk, the Core Long John is perfect for the cold nights of Winter or under your clothes on the ski slopes. The fit ends at the ankle. Made from 60% Cotton and 40% Polyester. Get your new Jack Admas core long johns from AlphaMaleUndies.We ship worldwide and at the best rates. All of the comforts of the Boxer Brief, but with the additional length for when you need a little more coverage. Perfect for under gym or basketball shorts. The length hits just above the knee. Get your new Jack Adams Core Cycle Trunk Underwear from AlphaMaleUndies. We ship worldwide and at the best rates. The support of a full brief with the flexibility and comfort of a boxer short. Built with the soft contour constructed pouch that Jack Adams is known for, this pair of underwear will come to the top of your thigh. Made from 60% Cotton and 40% Polyester. Get your new Jack Adams Core Boxer Brief Underwear from AlphaMaleUndies. We ship worldwdie and at the best rates. Check out the new collection that Jesse is wearing Jack Adams! jack adams 1970′s retro style throwback lined track short is great for running, or for a fun workout. This basic gym short is a must-have for your gym bag. Great, basic athletic short with the Jack Adams flair. Perfect for a tough workout or a quick run on the treadmill. Practical and lightweight. Made from 100% Polyester. Model: John Strand | Photography: David Wagner for Jack Adams. 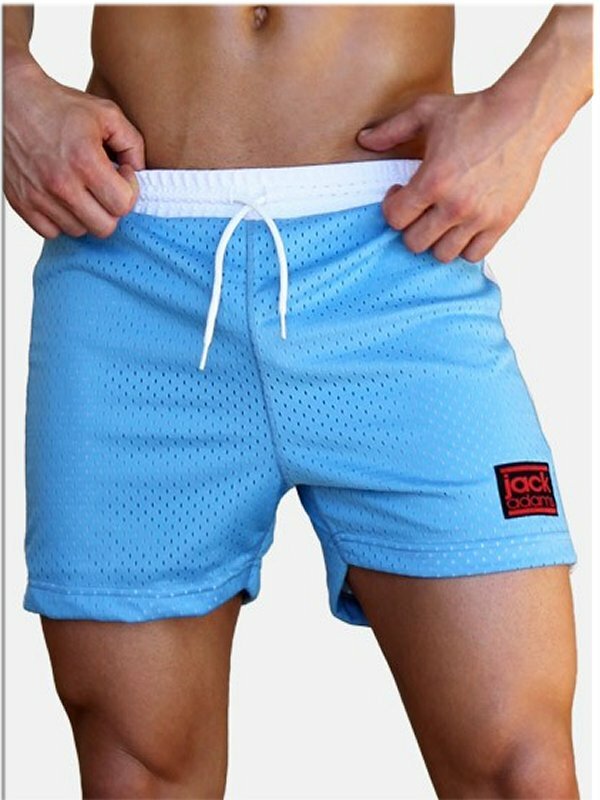 jack adams 1970’s retro style throwback lined track short is great for running, or for a fun workout. Great news for the fans of Jack Adams as well as for all of you who are looking for muscle tops and the latest in men’s activewear. Comfortable and stylish muscle hoodies for training or lounging at home have just arrived at AlphaMaleUndies. Extremely lightweight, exceptionally comfortable and remarkably cool, the Jack Adams Air Muscle Pullover Hoodie is a staple for the active man’s gym bag. As stylish as it is functional, it features a simple front pocket design with a drawstring hood and super soft fabric. This hoodie also features large side openings giving plenty of ventilation to keep your body cool and providing added exposure. Material: 100% Polyester. This design is availbale in Black, Sky Blue and White. This simple yet stylish hoodie is designed to keep you cool during training, on the street or lounging at home. Made from soft cotton blend, this lightweight sleeveless design is complete with a zipped front, a drawstring adjustable hood and front pockets. Look cool and stay cool with the Jack Adams Zip Front Muscle Hoodie. 60% Cotton, 40% Polyester. This design is available in Black and White. More new items by Jack Adams have just arrived at AlphaMaleUndies. Grab today some of the new Gridiron trunks or the all new Footballer Lace-Up Jockstraps. Read on for details and see the pictures of these new, very musculine underwear. With a super-wide 3” waistband and heavy-duty front pouch lacing, the Jack Adams Footballer Lace-Up Jockstrap gives the ultimate in support with a look that is unmistakably rugged and masculine. You’ll feel incredibly comfortable too with the thick knitted pouch that’s extremely soft and quality construction that makes this jock move with the body. This is a jockstrap that men will keep in their gym bag at all times. 70% Polyester, 15% Cotton, 15% Rubber. Click on the picture to make it yours! The Gridiron Trunk is a must-have piece of athletic wear that delivers functionality, support and a great sporty look. Featuring a thick 2” waistband with a drawstring and a bold zipper front, this masculine trunk is made of a super soft four-way stretch mesh wicking fabric that will keep men cool in the most humid conditions. It also includes the roomy contouring front pouch that Jack Adams is known for. Material: 95% Polyester, 5% Elastane. Available in black/white and black/red. Jacks Adams introduces its Varsity Mesh Jockstrap, inspired by the fall football season. Available now fromAlphamaleundies, the Jack Adams Varsity Mesh Jockstrap is a sporty jock designed for active wear, but it feels so comfortable that it will quickly become a favorite for everyday wear too. Featuring pin striped trim, this jockstrap is made from a soft four-way stretch mesh material that wicks away moisture while hugging the body. Together with its ergonomic fit and convenient fly front, you’ll want a pair for every day of the week! Made of 95% polyester and 5% lycra, this mesh jock is extremely soft. It is available in Small, Medium, Large and Extra Large and it costs 26 euros. Check out the jockstrap modeled by muscular underwear model and bodybuilder Dylan Austin Scott below. Photography by James Franklin.